If the car windshields are covered with ice, you shouldn’t wash them with hot water (the windshields can crack due to the temperature difference). It is also not recommended to turn on the windshield wipers frozen to the glass or try to tear them away. 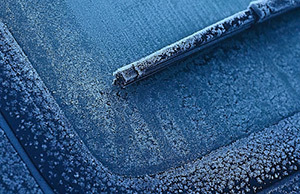 The windshield wipers and their hinge joints can be freed from ice by applying special defrosting liquids. These alcohol solutions dissolve the ice when applied to the frozen surfaces and clean windshields. Heating of the passenger compartment can speed up the process of defrosting the windshields and wipers.